Add cauliflower florets and potato to the pan and cook for another 5 minutes. Pour in the stock and add bay leaves, tarragon and caraway seeds and bring to the boil. Partially cover and simmer for around 15 minutes or until the cauliflower and potato is soft. Remove from heat and take out bay leaves and sprigs of tarragon. Remove about a cup and a half of the liquid and set aside. Let the vegetables cool slightly then blend in a food processor or with a hand-held blender until smooth and creamy. Add small amounts of the stock back in if your soup is too thick. Season with salt and pepper. Serve topped with chopped chives, tarragon or fennel leaves. Tip: This soup could be either a 1 carbohydrate serve snack or serve with some toasted wholegrain bread or a low GI roll to increase the carbs. Variations: Stir in some low fat milk or thickened cream. Wow! 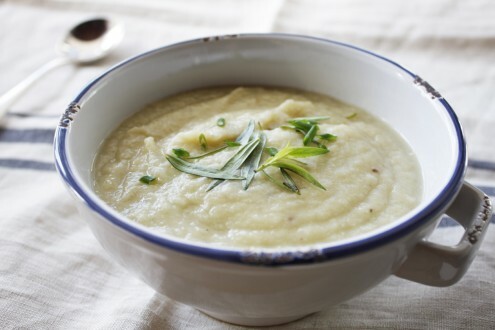 cauli, fennel AND caraway seeds…a combo made in heaven and perfect for a cold winter’s night. I haven’t tried this yet, but I bet it’s a great cold soup for the summer (maybe with a dash of yoghurt or cream post GDM). Love your site and I’ve told all my friends…you don’t have to have GDM to enjoy these great recipes. Hi Mum! This one is seriously yummy & little ones like it too. Served cold is a great idea – a bit like a vichyssoise I imagine. Yummo! Totally inspired to hit the shops and try this out tonight. Been craving a rich & creamy (but non-stodgy soup). Loving this website. I’ve got Type 1 diabetes and all the recipes look so lovely… I’m going to have fun working my way through them! Thanks for the inspiration! It would also be useful to have a link on your contact us – or a field for comments and suggestions like this one, on the home page. Love the idea, fantastic work.